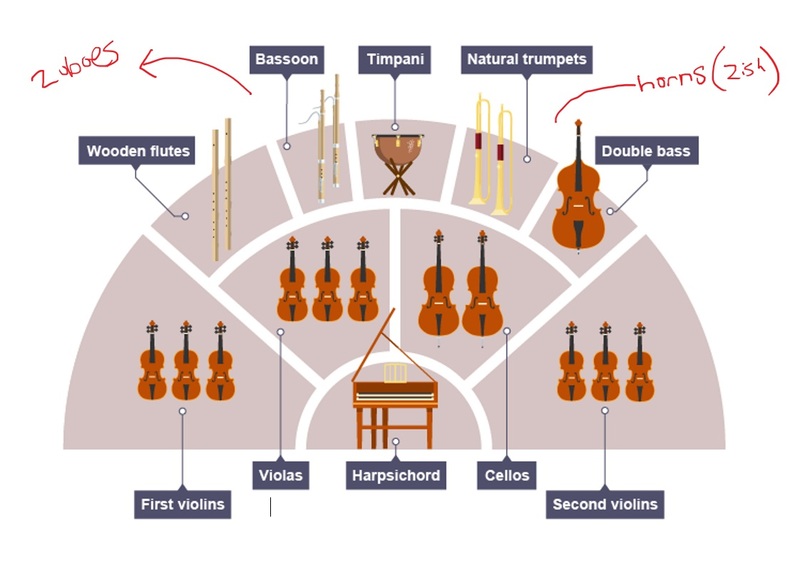 In today’s beginner’s guide to the orchestra, we’ll be getting into more detail on the orchestra – where the idea of an orchestra began and how it’s grown and evolved over time. If you missed part 1 of this series, definitely check that out to get caught up on the different instruments and their sounds. So we’ve talked about different periods in music history, like the Baroque, Classical and Romantic periods. We still haven’t talked about anything into the very broad “Modern” period, starting at the end of the 1800s, but we’ll touch on it a little in this video. I want to talk about the evolution of the orchestra, and discuss how it changed in each music period, from the Baroque and beyond. We’ll listen to a few clips of different orchestral performances across the ages so you can get a feel for how things have changed. In the Renaissance (previous to the Baroque era), people would get together in groups and play music – called a “consort”, but it wouldn’t be anything as large or formal as an orchestra. At the end of the Renaissance/beginning of the Baroque period, there was a dude named Monteverdi who helped create the orchestra as we know it. He wrote an opera called “L’Orfeo” in the early 1600s, and he got specific with what instruments should play what. Before that, individual instrumental parts weren’t specified. You just had some general sheet music, and, depending on what instrument you played, you would adapt that sheet music to suit your instrument. This idea of individual parts caught fire, and soon became standard practice in the baroque period. 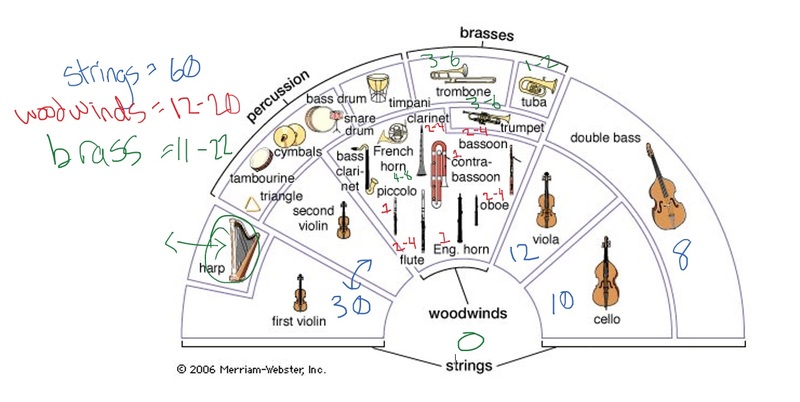 This individualization of instruments eventually led to the orchestra we know today. But since the orchestra was in its infancy in the Baroque period, and was much different than the orchestra of today, there are a couple of big differences. For one, there wasn’t any standardization – Baroque orchestras varied widely in shape and size from one place to the next. The main constants of the Baroque orchestra was the string section – violins were now better than ever – and the continuo, which was a background part improvised by a bass instrument and keyboard. The Baroque orchestra was also fairly small. This was before the days of big concert performances, and orchestra performances were usually held at a royal court, with about 18-25 instruments. So basically this music was for rich people, and was performed at rich people’s mansions, for the enjoyment of their friends and family. Let’s take a listen to a concerto grosso (orchestra) from the Baroque period. We’ll listen to Bach’s Brandenburg Concerto no. 1 in F major. In this you’ll hear instruments from a small but standard Baroque arrangement: 2 horns, 3 oboes, a bassoon, some violins, a viola and a cello, and a basso continuo. The orchestra expanded in the Classical era (from 1750-1825), but still wasn’t anywhere near as inflated as it would eventually become. The string section evolved from approx. 27 to 44. Woodwinds grew from 6 to 8 (basically added a couple clarinets), and horns stayed the same. A couple timpanis were added for percussion, and the harpsichord was being phased out in the late 1700s, later replaced by the new piano. When we think about symphony performances, we probably automatically think of symphonies from this era – ones by Beethoven and Mozart. Symphonies were the most common type of orchestral music then, but other genres like Concertos and Overtures would also make use of an orchestra. Toward the 1800s, orchestral music stopped being purely for the aristocratic wealthy. Public concerts became common, which is a big reason the orchestra continues to expand toward the end of the Classical era and into the Romantic era, which had the biggest orchestra size of all the time periods. Beethoven was one of the first composers to start expanding the orchestra for these larger spaces. He added percussion like the bass drum and cymbals, added some horns, a piccolo, and buffed up the string section to keep it equivalent with the other growing sections. Haydn was also awesome and played a big role in the development of the symphony as a musical genre, which is discussed a little more in http://www.pianotv.net/2016/04/classical-period-music-beginners-video-guide-part-2/”>another video. In this video, I’d like to take a listen to Beethoven’s famous fifth symphony, one of the most famous symphonies of all time. 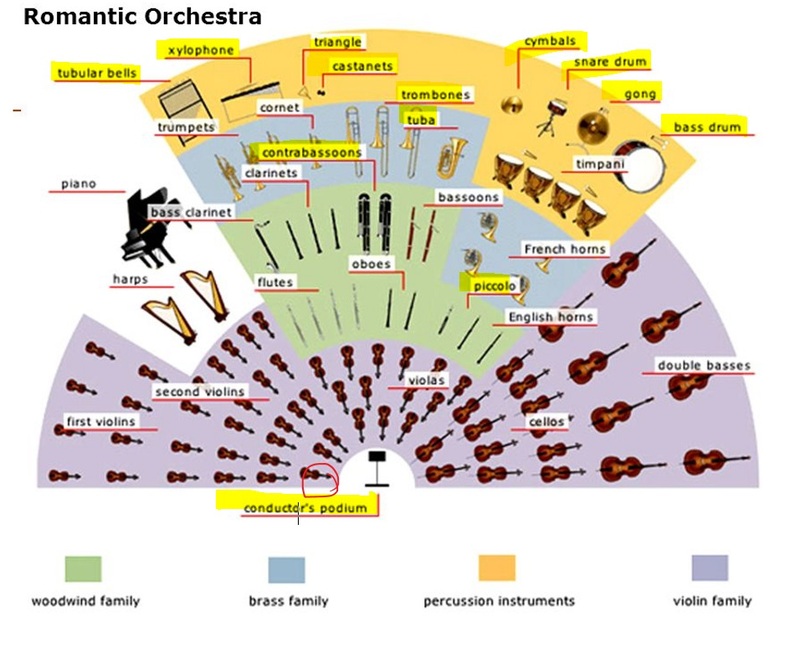 It’s a good example of the typical Classical orchestra setup, and it also shows the dynamic intensity that was becoming more common. Another reason that orchestras kept expanding was that the instruments kept getting better. In the Romantic era you had the invention of valves, and trombones and tubas entered the mix. Woodwinds were also being improved – larger finger holes and a better shape meant that flutes were easier to play and had a much louder sound. Instruments on the extreme high and low end – the piccolo and contrabassoon – were added to the mix. Because of all this expansion, the need for a conductor emerged. Prior to the Romantic period, generally the first violinist (the VIP violinist) would lead the orchestra, but with nearly twice as many people in an orchestra, a new person was required. So the conductor’s role was invented to help with timing and dynamics. Just like in the last video, I want to bring your attention to Tchaikovsky’s Sixth symphony, written toward the end of the 1800s. I think this song demonstrates the storminess and moodiness often found in romantic music, as well as the hugeness of the orchestra. Moments of this song are very turbulent and unsettling – I can’t imagine how shocking it would’ve been at the time – even in our world, where black metal and other difficult-to-listen-to-genres dull our senses, this one still gets under my skin. From the 1900s onward, the orchestra finally stopped expanding, and settled into the arrangement we know and enjoy today. That’s not to say that the orchestra became boring in the 20th century, with no change or evolution – au contraire! The 20th century was a time of wild experimentation. Composers started breaking conventions of all kinds – including tonality – and went off in a bunch of different directions. For some examples of that experimentation, Ravel and Ibeniz played with impressionism. 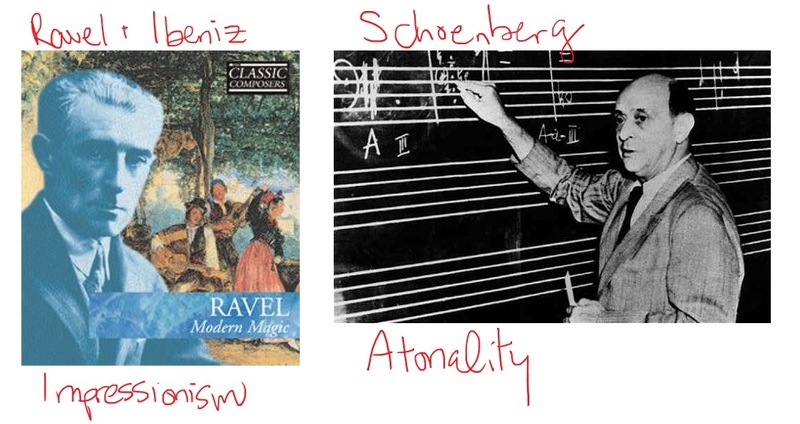 Schoenberg developed atonality and had many followers and imitators (music that wasn’t in a specific key, and sounds quite unusual). Composers like Pratella and Russolo developed Futurism, a style that recreated everyday sounds and used unusual instruments to produce them (like typewriters). 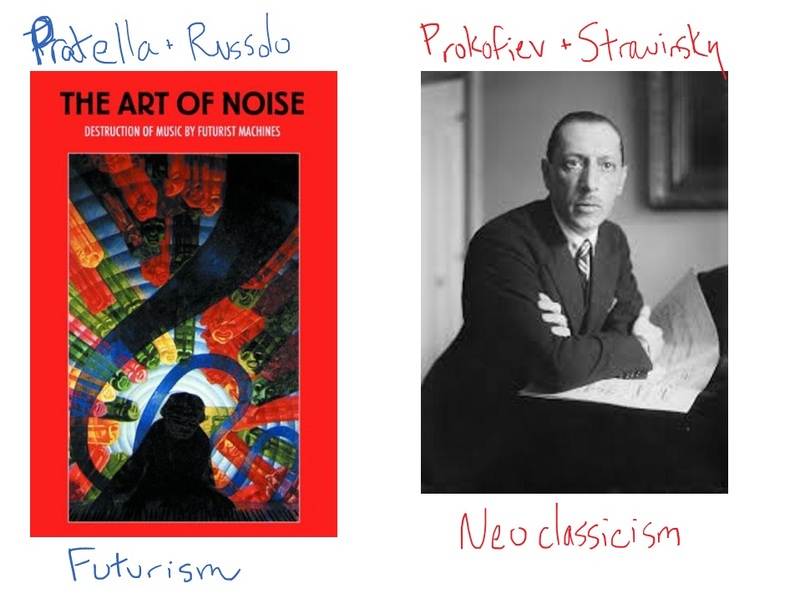 Some composers, like Prokofiev and Stravinsky, looked to Classical symphonies for inspiration for their own compositions (neoclassicism). A good example of a modern symphony is Shostakovich’s 7th symphony. Shostakovich was a Russian composer who lived during WWII and the Stalin regime, so his music was censored and he was forced to write patriotic music (or at least music that didn’t conflict with the interests of the regime). Anyway, there’s a whole story about his 7th symphony and its significance, but it was basically an anti-Nazi composition, and is still considered a symbol of the millions of Russian lives lost during the war. 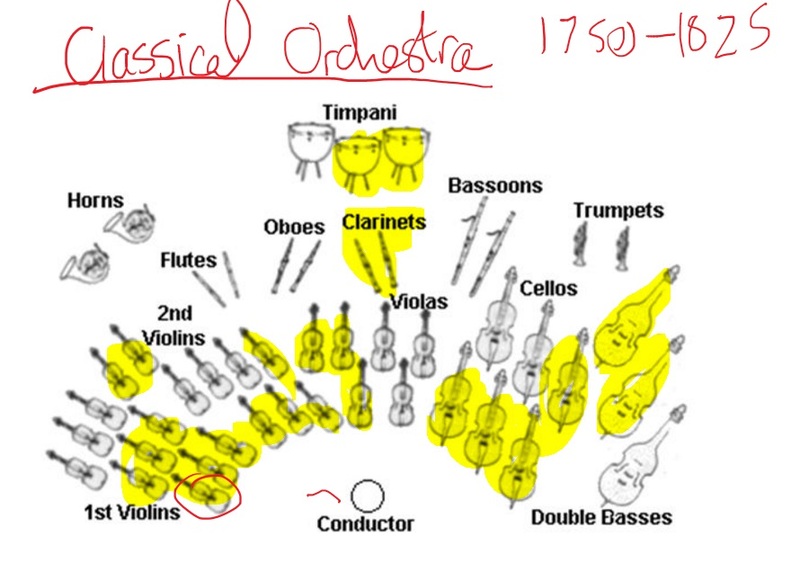 I hope you’ve enjoyed part 1 and 2 of this beginner’s guide to the orchestra. Hopefully you’ve learned something new, and your understanding of the different instruments has grown!